Fr. West's Catholic Blog: Pope St. Leo the Great, Deliver Us From the Culture of Death! Pope St. Leo the Great, Deliver Us From the Culture of Death! 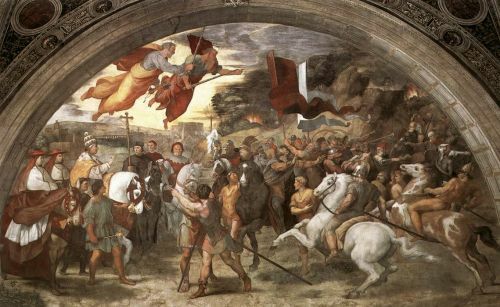 Above is a fresco of the Meeting between Pope St. Leo the Great and Attila the Hun in 452 A.D. by Raphael. The fresco is found in the Apostolic Palace in the Vatican. Pope St. Leo the Great was born circa 400 A.D. in Tuscany . He was the Pope from 440 to his death in 461 A.D. In 445, he persuaded Emperor Valentinian to recognize the Primacy of Rome. He clearly explained the doctrine of the Incarnation. His letter defending the Divinity of Christ was read at the Council of Chalcedon in 451. Many historians praised him for his diplomacy during the Barbarian invasions. In 452, Pope St. Leo met Attila the Hun at the gates of Rome and persuaded him not to pillage the city. According to legend, St. Peter and St. Paul could be seen dressed as bishops standing on each side of the Pope holding swords above Attila’s head threatening him with death if he didn’t heed the Pope's pleas to leave the city in peace. Later, when the Vandals invaded Rome, Pope St. Leo persuaded their leader Geneseric to stop pillaging the city. He was a prolific writer, and many of his writings survive to this day. Like ancient Rome, Western Civilization is threatened today by corruption within, the ravages of the culture of death – an anti-life mentality that manifests itself through abortion, contraception, sterilization, physician-assisted suicide, euthanasia, etc. and threats of terrorism from the outside, although home-grown terrorism is also a growing threat. We need the prayers and example of Pope St. Leo the Great to help us to turn back the barbarians in our time. Pope St. Leo defended life and used diplomacy to turn back the threat of terrorism. Pope St. Leo the Great, assist us in the work of evangelization and the spread of the Gospel of Life. Help us to overcome the corruption of good morals in our times. 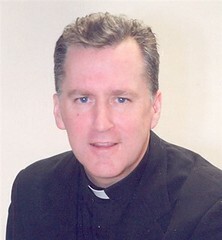 Give us courage to confront the culture of death. We pray that human life will be respected and protected at every stage of development. Pope St. Leo the Great pray for us, that God will deliver us from the threat of war and terrorism. Grant us peace in our country and peace throughout the world. Help us to build a new culture of life and a civilization of love. We ask this, and all our prayers, through Christ Our Lord, true God and true man.